Best Places to Live No. 19 "Most Secure Places to Live 2011 (Small Towns)"
Forbes Magazine No. 12 "Best Small Place for Business and Careers 2012"
The Atlantic No. 4 "America's 25 Brainiest Metros 2013"
National Geographic Adventure Magazine "Best Places to Live '07"
Forbes Magazine No. 8 "Top Up and Coming Tech Cities "
Kiplinger No. 10 "Smart Places to Live"
There are many activities in the region available throughout the year to satisfy any indoor and outdoor palate. The university is the location for many different cultural attractions, from fine arts in the University of Iowa Museum of Art; touring acts and Broadway shows at Hancher Auditorium; and a seemingly endless number of recitals and plays produced by various departments at the University of Iowa. Outdoor activities abound from minor-league baseball and hockey to Lake MacBride, numerous rivers for canoeing and kayaking, and plenty of biking, hiking, and walking trails. Downtown Iowa City is the center of activity for the metropolitan area, home to numerous independent restaurants and shops along with a smattering of national chains. The center of downtown in the Pedestrian Mall (aka Ped Mall), a three-block area of shops and restaurants where Iowa Citians gather throughout the summer for events such as the Friday Night Concert Series, the Iowa Arts Festival, and the Iowa City Jazz Festival. Downtown Iowa City is also home to the bi-weekly Iowa City Farmer’s Market, running from May through October, where farmers and artisans from around Iowa peddle their wares. At the heart of Iowa City is the University of Iowa. With a campus located next to downtown Iowa City, the University and downtown area seamlessly mix, creating a vibrant central core that most cities would envy. And while downtown Iowa City bustles, there are many quiet, historic neighborhoods filled with tree-lined streets hiding classic, Midwestern homes. Worth special mention is the Hamburg Inn No. 2, a must-stop for all Presidential candidates making their way through Iowa before the Iowa Caucuses. Featured in the book Road Food as well as on TV’s “The West Wing,” the ‘Burg is Iowa City’s classic diner known for their annual Coffee Bean Caucus. Of course, there are plenty of other dining establishments getting rave reviews in the region, from delectable meals served in fine-dining establishments to greasy spoons. 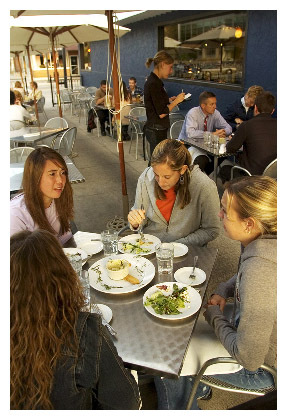 Iowa City is also a center in the slow-food movement, with a number of restaurants and grocery stores specializing in locally produced food. On Saturdays in the fall and winter, Iowa City bustles with the excitement of Hawkeye sports. Activities don’t stop in the winter either, with cross country skiing and Hawkeye basketball taking center stage. In the spring, cyclists take to the streets in the annual Old Capitol Criterium as well as along the miles of biking and walking paths in the Iowa City/Coralville/North Liberty area. 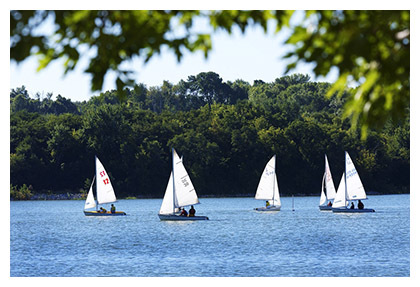 Summertime finds area residents enjoying Lake MacBride. Minor League Baseball in the Midwest League is also an essential part of summertime fun, as future major leaguers are found 20 minutes up the road in Cedar Rapids along with slightly longer trips to the Quad Cities, Burlington, and Clinton. A summer evening watching baseball in the Quad Cities while the Mississippi River flows by the outfield berm is not to be missed! There’s a lot more to the area than Iowa City – there are a number of fantastic regional attractions that should be explored. Just 20 minutes west of Iowa City are the Amana Colonies, seven former communal villages that retain their German heritage and their historical architecture. In NE Iowa – besides the fantastic natural scenery – lies the Field of Dreams movie site just outside of Dyersville, IA. In Dubuque, the National Mississippi River Museum and Aquarium – affiliated with the Smithsonian Institution – is a new addition to the attractions of the area, serving as the official showplace of the Upper Mississippi River. Burlington’s Snake Alley competes with San Francisco’s Lombard Street for the title of “Crookedest Street in the World.” And Fairfield/Vedic City is the home to the Maharishi University of Management, founded by followers of Maharash Maresh Yogi. The presence of followers of the Yogi has brought a number of unique and unexpected businesses and residents to the Fairfield area. There are a number of fantastic natural attractions in and around the Iowa City area, as well. Within 45 minutes of Iowa City, a person can stand on the banks of the mighty Mississippi River and watch the river traffic march by. In NE Iowa, generally above Dubuque, starts the most scenic stretch of the Mississippi River, with wintering eagles found amongst the majestic bluffs of the river and its tributaries (especially the Upper Iowa River, Turkey River and others). Parks such as Effigy Mounds National Monument, Pikes Peak and Neal Smith National Wildlife Refuge provide scenic vantages of the countryside while quaint towns such as Decorah, IA and Galena, IL certainly surprise first-time visitors. For a long day trip, nothing beats the Loess Hills in western Iowa – a rugged landscape of windblown silt deposits that are only rivaled by China’s Yellow River deposits. 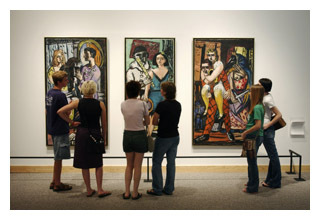 Surrounding cities also feature a wealth of cultural activities, including American Regionalist paintings (from artists including Cedar Rapids native Grant Wood) at the Cedar Rapids Museum of Art, the new Figge Museum of Art in Davenport, IA (in a David Chipperfield designed-building theNew York Times calls “a monument to that notion of good taste”), and Legion Arts/CSPS, a Cedar Rapids performance space and art gallery house in a former Czech social club. 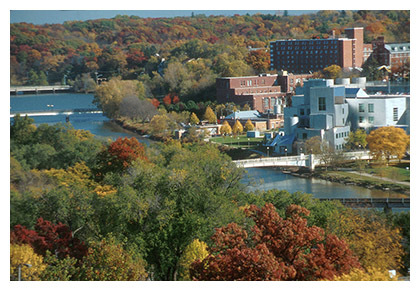 Additionally, Cedar Rapids features several other museums and cultural attractions such as Science Station, the African-American Historical Museum & Cultural Center of Iowa, and the Cedar Rapids Symphonic Orchestra. Life in the Quad Cities focuses on the Mississippi River, and Davenport’s River Music Experience explores the music of the Mississippi River. Additionally, the Quad Cities are known for their annual Bix 7 road race, a race that attracts top runners and is best-known for the steep bluffs that participants must run up at the start and the end of the race. Des Moines offers an increasingly bustling central core along with the amenities of a large metropolitan area, including AAA baseball, a Botanical Gardens, Zoo, and Adventureland Park. Des Moines is also home to several renowned annual events, including the Arts Festival and the Iowa State Fair, featured in the book 1000 Places to See Before You Die. Additionally, major cities such as Chicago, Minneapolis, and St. Louis are all within 3-5 hours and great for a weekend away.